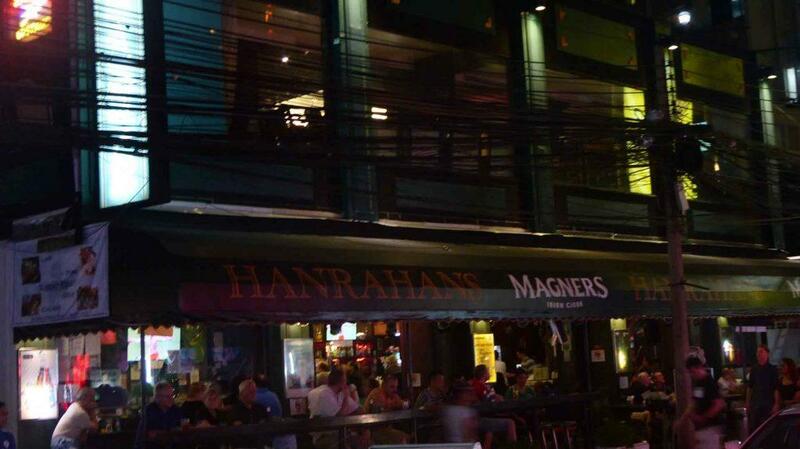 Hanrahan’s is a busy Irish pub on Sukhumvit Soi 4 near to Nana Plaza. 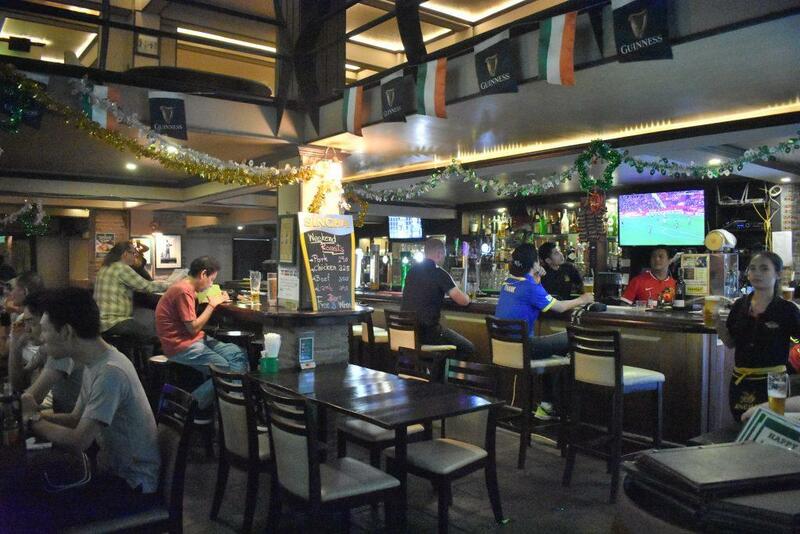 There are 3 floors with the ground floor good for watching sport on the big screen and a comfortable dining area as well as an outside terrace to watch the street scene on busy soi 4. The 1st floor has a challenge pool table while the 2nd floor has a quiet open-air roof terrace with magnificent views over the street below. There is live sport on the big screen and smaller TV’s allowing multiple events to be shown at the same time usually with English commentary for live EPL football and International Rugby matches. There is also occasional live music. The crowd are almost entirely tourists and expats. Happy hour is between 16.00-20.00 with pints starting at 100 baht and bottles from 80 baht. The kitchen is open between 08.00-23.00 serving International pub grub, Thai food, bar snacks, and sandwiches. There are free WIFI and daily English newspapers. Hanrahan’s is a short walk from Nana BTS station. Location: Sukhumvit Road Soi 4. (opposite Nana Plaza). 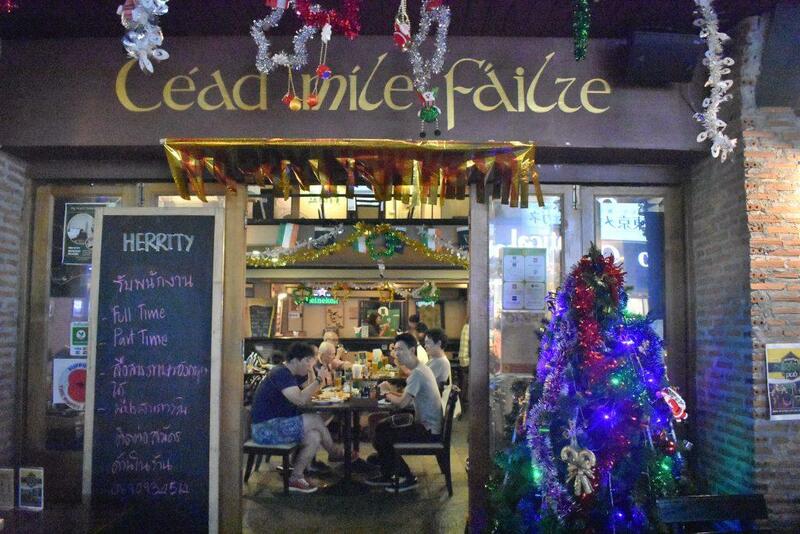 The Drunken Leprechaun is a small Irish pub located on Sukhumvit Soi 15 on the ground floor of the Four Points Sheraton Bangkok Hotel. On entering you will be greeted by a gimmicky green-clad ‘little person’. There is nightly live music at 20.00 Tuesday-Saturday and live sport on the big screen (commentary on Sunday only). The daily happy hour is between 16.00-20.00 and an all-night happy hour every Thursday from 16.00 till closing time. There is an International pub grub menu. 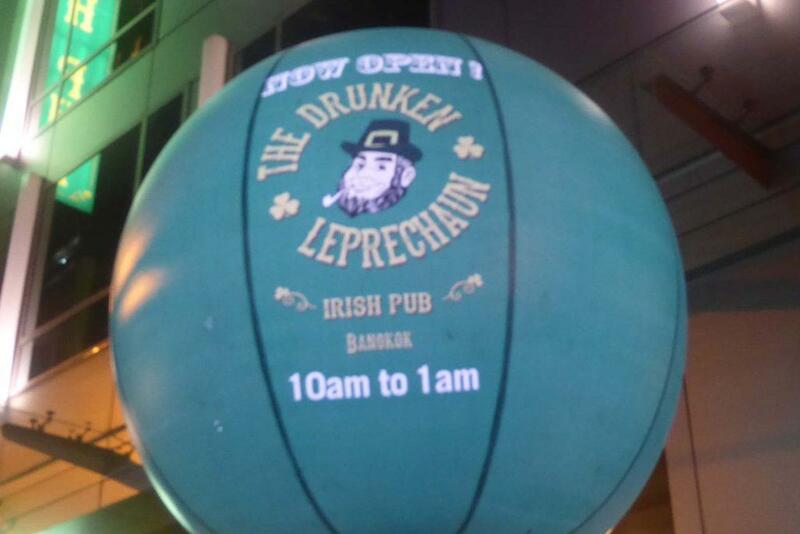 The Drunken Leprechaun is a short walk from BTS Asoke & MRT Sukhumvit stations. Location: 79/4 Sukhumvit Road Soi 15. Four Points Sheraton Bangkok Hotel. 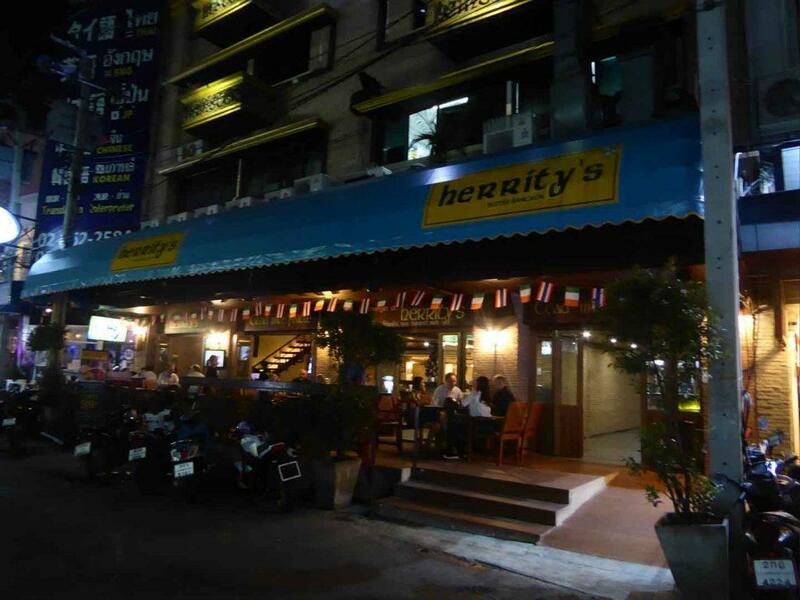 Herrity’s is an Irish pub and boutique hotel located on Sukhumvit 33/1 along with the Robin Hood and the Royal Oak pubs. It was formerly known as the Dubliner. There is the usual sport on TV and occasional live music. Happy hour is 16.00-20.00 and there is a pub quiz on Wednesday evenings. 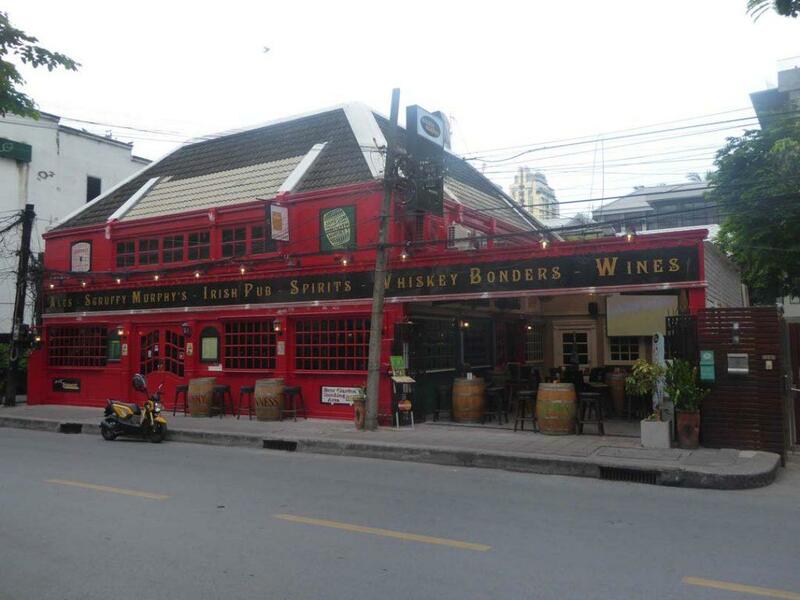 The pub has a nice outdoor terrace and Rooms above the pub starting at 1700 baht per night for a standard double. Location: 595/21 Sukhumvit Road Soi 33/1. 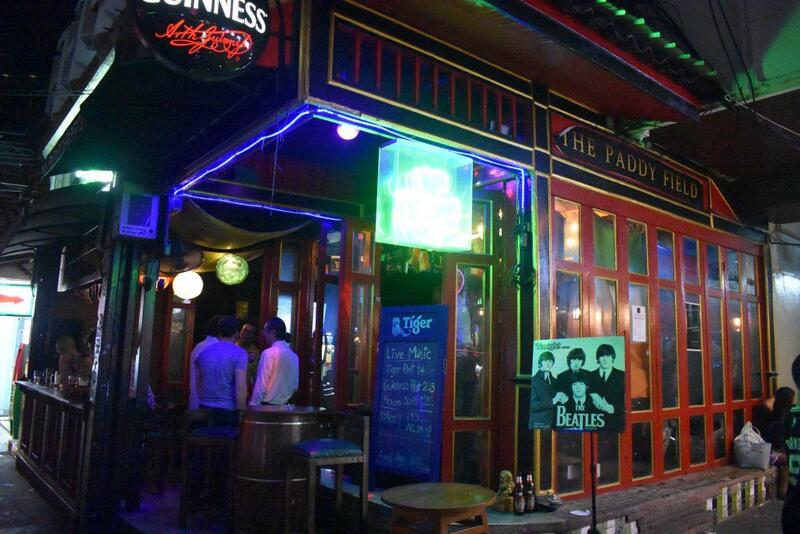 Mulligans is an Irish themed pub on Khaosan Road. 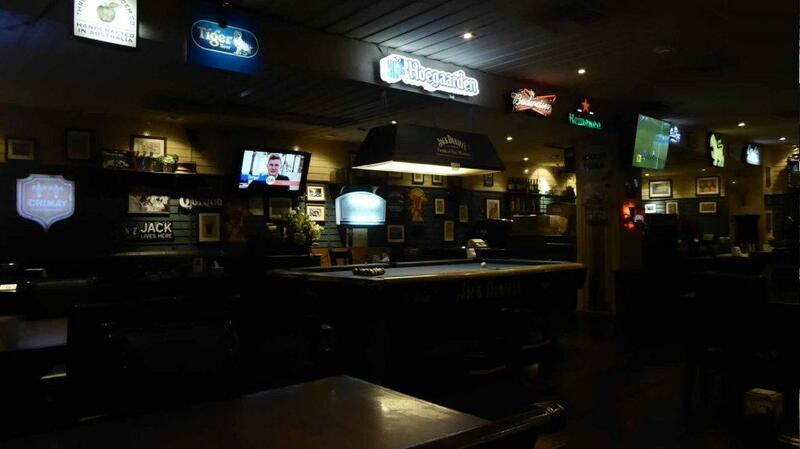 The main pub is located on the 1st floor of the Buddy Lodge Hotel and there is a roadside terrace on the ground floor. The pub is unique as it is open 24 hours a day. 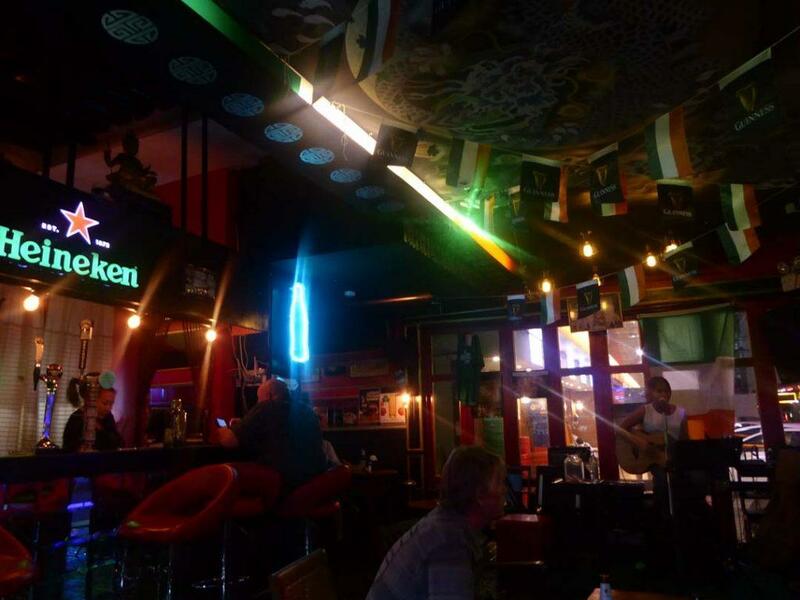 There is a restaurant in the main bar serving International pub grub and a large Thai menu. The kitchen is open 24 hours and has a breakfast buffet starting at 06.00. 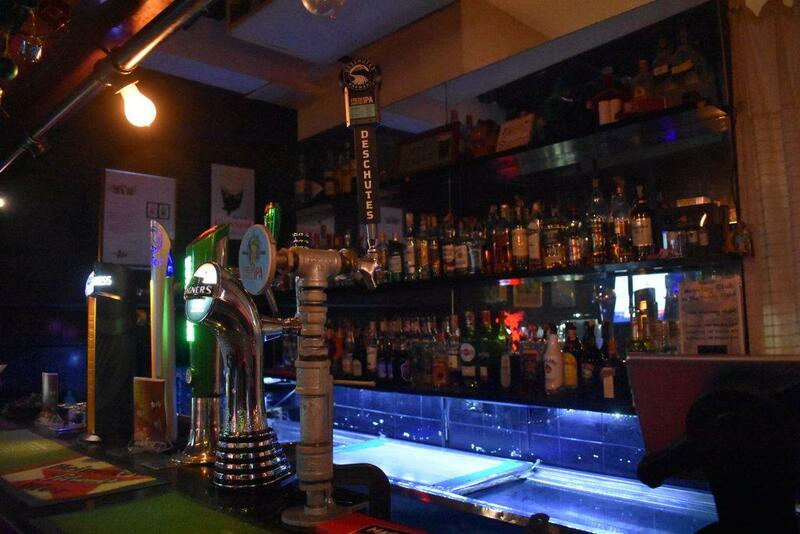 The bar has a great selection of imported draught beer Stella (from Belgium not UK), Leffe, Hoegaarden, Guinness, Paulaner, and Punk IPA as well as local beers. 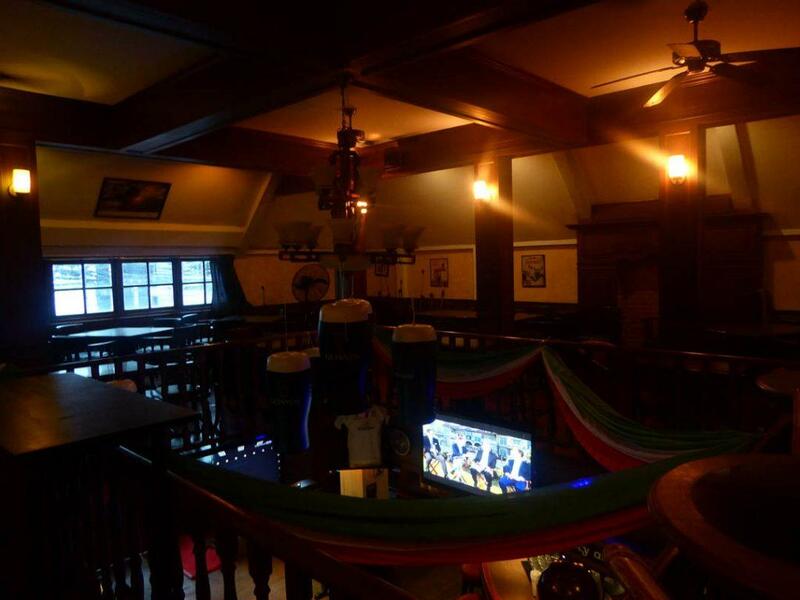 There are 2 happy hours 15.00-20.00 and 02.00-04.00 and 15 TV’s to show all major sports (no commentary). 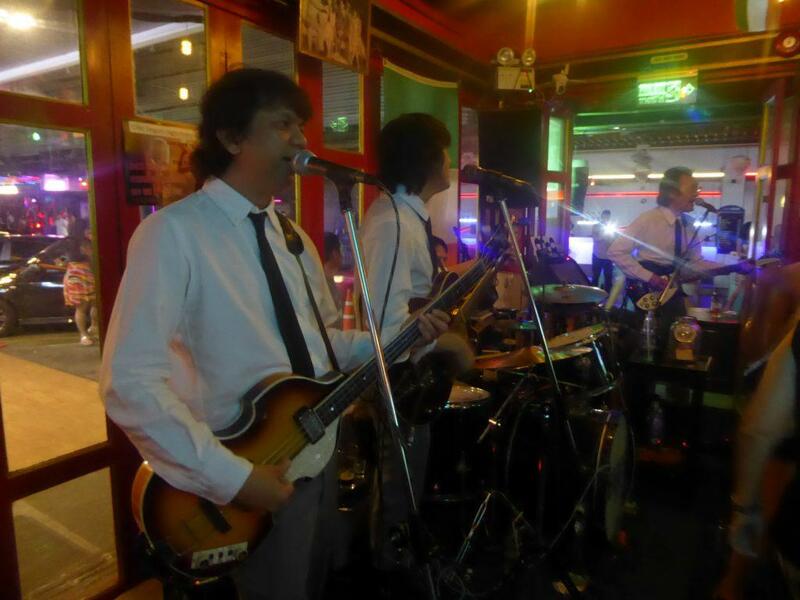 Live music on Monday-Saturday with 2 bands nightly at 22.00 and 24.30 playing western and Thai covers. There is also a pool table and arcade games. The crowd is a mix of local Thai’s and foreign tourists. Location: 265 Khaosan Road. 1st floor of Buddy Lodge Hotel. 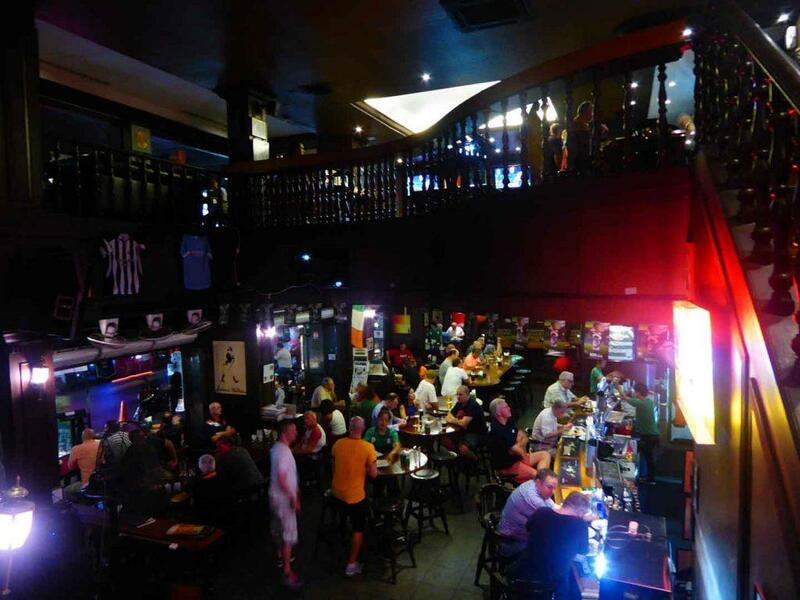 Scruffy Murphy’s is an Irish Pub on Sukhumvit Soi 23 just across the road from Soi Cowboy. It looks like a real pub inside with plenty of comfortable seating, an upstairs balcony, and a covered outdoor side terrace. 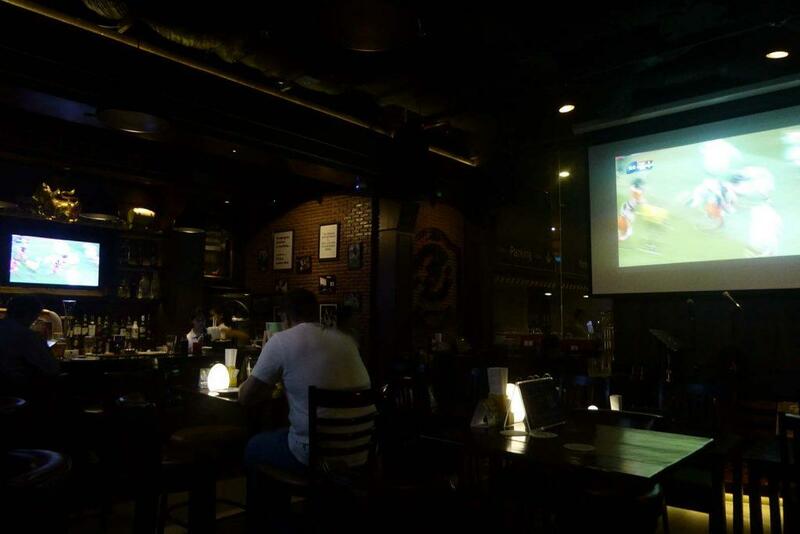 There are big screens inside and outside showing live sports. Irish sports are a specialty here and daily Irish newspapers are available. 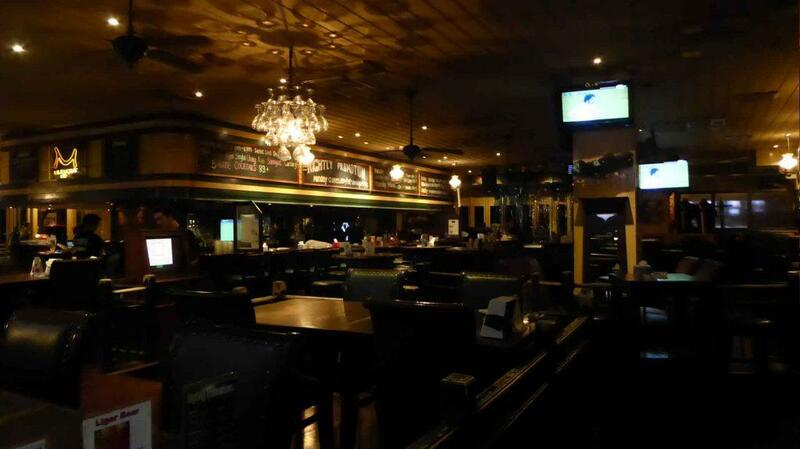 The pub serves up the usual pub grub with the addition of several Irish specials and a Thai menu. There is live Irish music on Thursdays & Fridays outside on the patio. The daily happy hour is 10.00-19.00 daily with a second happy hour from 22.00-01.00 on Sunday-Thursday. A daily breakfast special has 7 items for 220 baht. Daily specials include half-price wings on Mondays, Pie & free bottle of Singha beer and free flow gin & tonic for ladies from 19.00-21.00 on Tuesdays. Wednesday features a free pint of Singha with any burger from the menu, Thursday has a free BBQ from 19.00 while Friday has 2 for 1 fish n’ chips. There is a Sunday roast at 320 baht every Sunday between 11.00-16.00. Address: 12/8 Sukhumvit Soi 23, (opposite Soi Cowboy), Bangkok. How to get there: BTS Asoke Station (exit 6). Cross the Asoke intersection and turn left into Sukhumvit Soi 23. Scruffy Murphy’s is on the right-hand side. MRT Sukhumvit Station (exit 2). 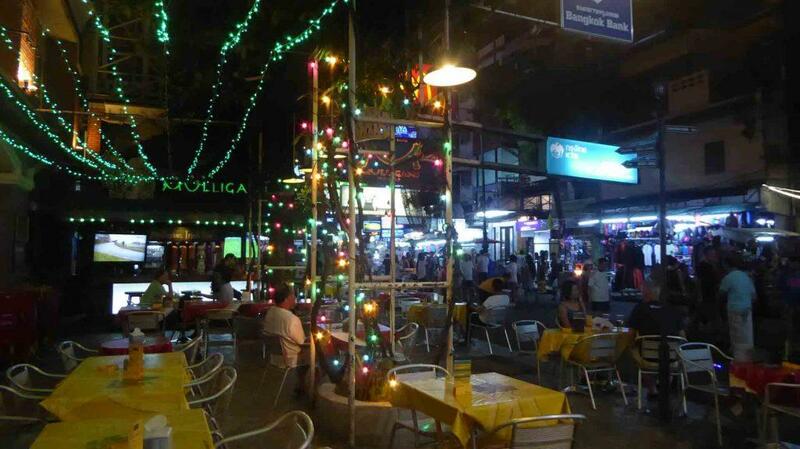 Walk up Sukhumvit Road and turn left into Sukhumvit Soi 23. Scruffy Murphy’s is on the right-hand side. 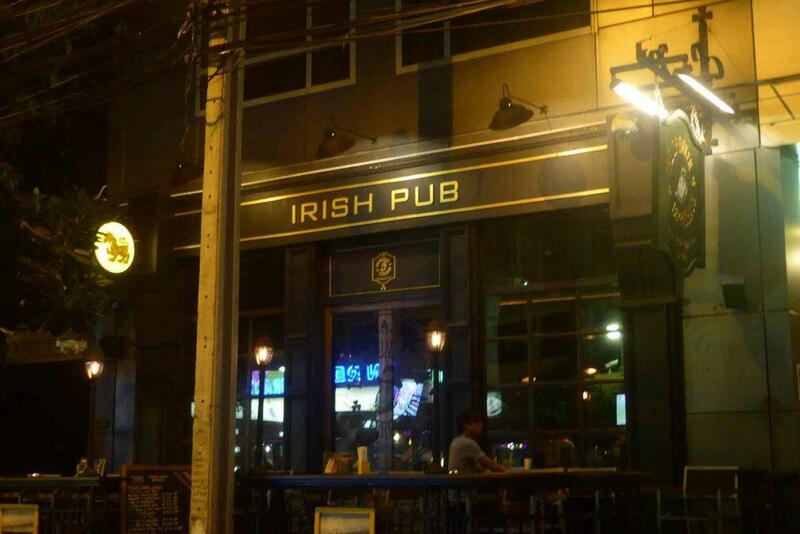 The Paddy Field is an authentic Irish style pub located in the middle of Patpong Soi 2 in the Silom district of Bangkok. 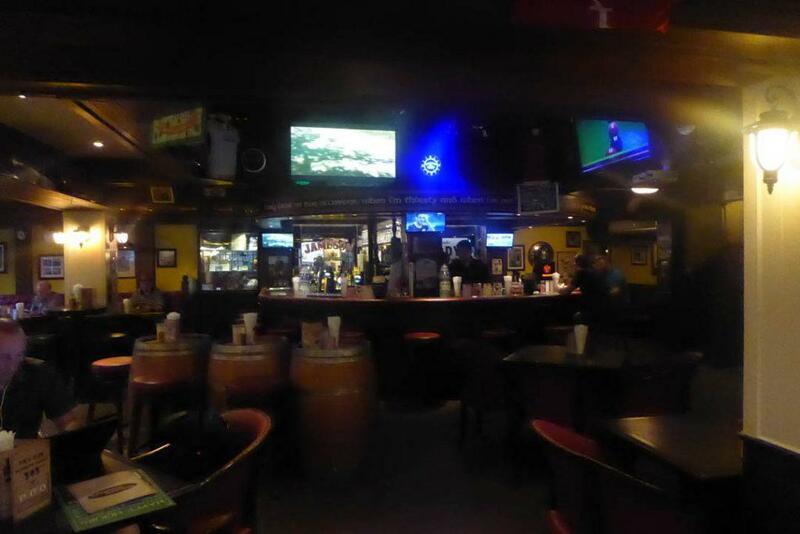 The pub is small but has tasty food, a friendly atmosphere, live music, and good service. There is Guinness, Kilkenny, Heineken, and Tiger on tap. The daily happy hour runs from 11.00-20.00. There is a full food menu and daily specials from Monday-Thursday. Monday is pie and pint night at 349 baht, Tuesday is lamb doner & pint night at 349 baht, Wednesday is Curry & pint night at 279 baht, Thursday is burger & pint night at 299 baht. There is a pub quiz every Tuesday at 19.30. Address: 9 Soi Patpong 2, Silom Road, Bangkok. Getting There: BTS Sala Daeng Station (exit 1), MRT Silom Station (exit 2).